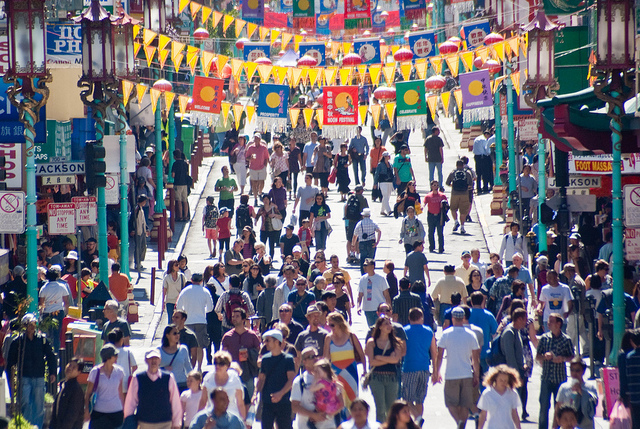 Ciclovías (car-free street events), such as this one in San Francisco, bring health benefits outweighing their financial costs. Photo by Frank Chan. A new report examining urban population densities found that, on the whole, growing cities have maintained dense urban cores, while shrinking cities have not. The report, “Urban Growth and Decline: The Role of Population Density at the City Core,” investigates the population changes in 180 U.S. metropolitan statistical areas (MSA) using Census data from 1980, 1990, 2000, and 2010. For future research, the report’s authors suggest answering the question of whether it a high density urban core or simply the average density across an entire MSA that is so important to urban growth and productivity. Depending on such discoveries, the researchers say it is important to consider the possibility of policymaker involvement to help ensure productive urban densities are maintained. The presence of painted bike lanes do not lead to increases in traffic crashes, according to a new report published in the American Journal of Public Health. The report’s researchers studied New York City streets with bike lanes that were incorporated between 1996 and 2006, as well as bike lane-free streets of similar design features and urban contexts. The researchers found that the total number of traffic crashes were not significantly different between streets with and without bike lanes. There were also no significant crash differences when isolating vehicle crashes, bike crashes, pedestrian crashes, and crashes leading to serious injury or death. If able to control for the variable of increased bike traffic, overall crash rates would reveal themselves to be lower on streets with bike lanes, the report says. Research recently published in the Journal of Urban Health adds further incentive for cities’ hosting Ciclovías (car-free streets), finding that their health benefits outweigh their financial costs. The research involved a cost-benefit analysis on four Ciclovía programs: the original Ciclovía program in Bogota, Colombia; Via RecreActiva in Guadalajara, Mexico; Medellin Ciclovía in Medellin, Colombia; and the Sunday Streets program in San Francisco, California. In examining the San Francisco program, with its current financial scenario projected to the scale of being a weekly event series (there have been nine Sunday Streets events to date), the total annual program cost would total $1.7 million and translate into an annual per capita cost of $70.50. The researchers calculated this investment to create a cost-benefit ratio of 2.32, bringing $2.32 dollars in medical-related savings to every program dollar invested.